EdTechTeam, a California Benefit Corporation, is a global network of educational technologists dedicated to inspiring and empowering educators by exemplifying the team’s values in their work. The team works toward a vision of the future where students become compassionate citizens who understand that they can solve real problems in the world, and where their education and access to technology make this possible. School Change is never easy, so EdTechTeam helps schools focus on Student Agency by building capacity in Courageous Leadership, Empowered Teachers, Inspiring Spaces, Engaged Community, and Robust Infrastructure. 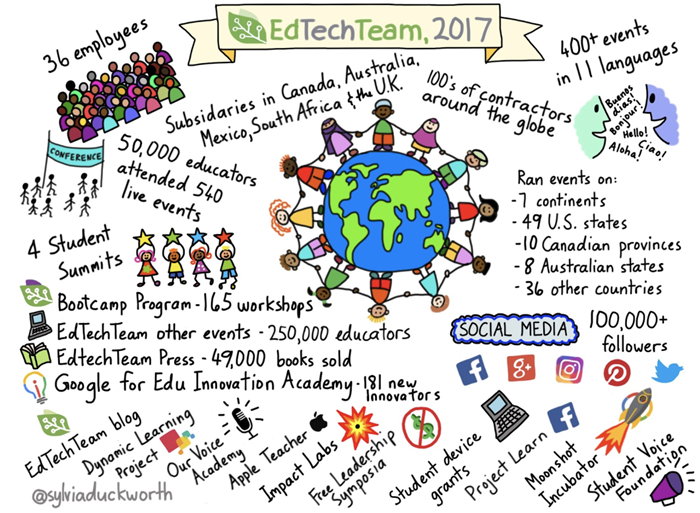 With 36 employees and hundreds of contractors around the globe (most current or former educators), EdTechTeam has subsidiaries in Canada, Australia, and Mexico, with joint ventures in the South Africa and the UK. The team operates in 49 US states (Montana, we’re coming for you in 2018 – and we’ve seen you in our online courses! ), 10 Canadian provinces or territories, 8 Australian states or territories, 36 other countries, and on all 7 continents. To meet the needs of educators around the globe EdTechTeam produces professional development experiences in 11 languages. In 2017, EdTechTeam hosted over 50,000 participants at 540 live events produced by the team, and impacted nearly 250,000 educators through books, webinars, live broadcasts, and community events – including other conferences. Millions of students are impacted by educators who learn with EdTechTeam. EdTechTeam is a Google for Education Professional Development Partner and the global leader in Google for Education Certification. Having been involved in leading the Google Teacher Academy from its inception in 2006, EdTechTeam continues to manage the Google for Education Innovation Academy, inducting 181 new innovators from cohorts in London, Washington DC, Sydney, Stockholm, and São Paulo in 2017. The team is best known for a world-wide series of Summits featuring Google for Education, with over 400 conference-style events produced to date, and 115 around the globe in 2017 alone. The Bootcamp program produced another 165 workshops globally, most focused on helping educators achieve level 1, level 2, or Trainer level certification with Google. As an Apple Professional Learning Provider, EdTechTeam offers professional development featuring Apple. These online courses, on-site workshops, and conference-style events are designed to celebrate educators and help them make the most of Mac, iPad, and built-in apps to enhance student learning. In 2017, EdTechTeam produced five conference-style events across the US, and provided custom solutions to large school systems committed to Apple. EdTechTeam is the ideal provider to help schools integrate their G Suite implementation with their Apple hardware. In addition to these Google and Apple themed events, the Custom Professional Development team worked with schools to provide 207 additional learning experiences for educators, ranging in size from small workshops to district-wide training days, drawing from a broad catalog including a variety of topics from specific tools to pedagogical approaches such as project based learning. Several new bootcamps were offered in 2017, including the Learning & Leading Administrator, Clerical/Classified Skills, HyperDoc Bootcamp, STEM – Drones, and Beyond Code. Face-to-face programs are supplemented by EdTechTeam Online, including facilitated cohorts for certifications and graduate credit, and a library of self paced Just in Time Courses. Programs focused on students also continued in 2017, with four conference-style Student Summits. Many districts (and partners) work with EdTechTeam on an ongoing basis to provide coaching and consulting for teachers and leaders. In partnership with the Moonshot Incubator, EdTechTeam also offered eight days of discount priced design thinking workshops for local teachers on Kaua’i. EdTechTeam Canada reached 7446 Canadian Educators in 68 events across the country in three different languages (English, French, and Ojibwe). In addition to focusing on Google for Education and Apple Teacher training, EdTechTeam Canada added a partnership with Microsoft for Education to the professional development opportunities schools can choose. EdTechTeam Canada offered Two FREE Geo Adventures, the Rocky Mountain Adventure in Jasper, Alberta and a Dog Sledding Adventure in Yellowknife, NT. EdTechTeam Canada hosted four FREE Playground events at teachers conventions and two significantly price-reduced Student Summits in high need regions. A class set of touch-screen convertible Chromebooks was donated to a school in Ottawa as part of EdTechTeam’s pilot 1:1 grant. In 2017 EdTechTeam ANZ, now a Chromebook Reseller, worked in every Australian state or territory and on both islands of New Zealand, impacting 4,912 educators in partnership with Departments of Education, Catholic and Adventist school systems, and independent schools across both countries. The team is particularly proud of partnering with the NSW Department of Education to provide quality professional development to teachers in remote locations, and of the ongoing relationship with the ACT Department of Education to provide professional learning to teachers across the Territory. Professional development from EdTechTeam is now accredited by NSW through NESA and ACT through TQI, which helps teachers in those states reach mandatory accredited hour requirements. For events in New Zealand, EdTechTeam ensures that respect for the indigenous population is offered through traditional Maori welcome ceremonies and by recruiting Maori educators as presenters and speakers. EdTechTeam ANZ also donated prizes to local Google Educators Groups, and donated time or resources (including cardboard for VR treatments) to children’s hospitals in both Melbourne and Sydney. With the return of the Mexico City Summit, EdTechTeam Mexico served 1,395 educators face-to-face in 2017. EdTechTeam Mexico is also a Chromebook Reseller and offers a program called ImpactoEDU, which is designed to develop key competencies in students: problem solving, information analysis, decision making, creativity, collaborative learning, and communication (through access to devices, curated applications, and professional development). In 2017, EdTechTeam Mexico managed a local grant for Google, offered local custom professional development, and maintains a local social media presence. Most services were in Spanish, and the EdTechTeam Press book Classroom Management for the Digital Age was translated into Spanish for use in Mexico (and elsewhere). EdTechTeam Mexico donated 50 summit tickets to educators in need. 2017 was the first year EdTechTeam South Africa offered summits in three locations around the country, Cape Town, Johannesburg, and KwaZulu-Natal. Local Bootcamps are also available for Google Certification and Apple Teacher Certification. Additional custom local services are offered throughout the country via EdTechTeam’s partner Cloud Education Solutions. Absolutely loved the summit. Feel quite overwhelmed by everything but excited to get started with Google classroom and then go from there. One step at a time in the right direction. Thank you offering it here. Not having to travel allows us to include more of our teachers. EdTechTeam UK hosted its first Seminar (a low-cost summit-inspired event for the UK market) in addition to 15 Google Certification Bootcamps and other custom events. The team also supported 5 UK TeachMeets, which are FREE for teachers, and made donations to the King Edward VI Student Council Conference. The Emerging Markets team served 3,061 educators in 22 countries in 2017. For the first time educators in Egypt, Lebanon, China, Finland, Iceland, Colombia, Costa Rica, and Taiwan were able to attend an EdTechTeam event in their own countries. In Latin America, EdTechTeam was able to create a network of empowered professionals across the region who in turn built local capacity in their local communities. Directly serving 750 educators in eight countries, EdTechTeam Latin America provided 397 vouchers for certification workshops, certified eight new local trainers, and supported three Google Educator Group (GEG) communities. In partnership with US Embassies in Bolivia and Peru (and with local hosts in other countries), EdTechTeam also brought Impact Labs, a low cost program focused on long term impact, to six countries. Approximately 60% of these services in Latin America were in Spanish. EdTechTeam also supported the Portuguese language Innovator Academy and GEG in Brazil. In East Asia, lower pricing options are used to make it easier and more affordable for teachers to access events in areas that don’t have a lot of opportunities. And in Bangalore, EdTechTeam offered a FREE training day for local teachers prior to TechConX. EdTechTeam Press featured a catalog of 18 titles and sold 49,000 volumes in 2017. Press also introduced a Masterclass tour in Australia , the United States, and online, allowing almost 2000 participants to work directly with the authors, ask questions, discuss the book’s big ideas, and dig into content to make lasting change in a school. Project Learn is a new Facebook community where authors and readers can interact on an ongoing basis year round. In emerging markets, EdTechTeam Press books were offered at steep discounts. The EdTechTeam Community connects educators on Twitter, Google Plus, Facebook, YouTube, Instagram, Pinterest, and anywhere the #EdTechTeam hashtag can be used, with over 100,000 followers across all platforms. EdTeachTeam also hosts a community blog, featuring a total of 160 posts from 120 different bloggers from the community. Fourteen virtual summits, webinars, and author events allowed educators to connect live for free from anywhere around the world. In 2017 EdTechTeam continued a series of FREE Leadership Symposia designed to gather together building and district leaders for a full-day event filled with practical, leadership focused sessions by and for leaders. Focusing on the challenges of leading school change in today’s challenging educational climate, these events were hosted in Cleveland, OH, Palo Alto, CA, and Chicago, IL, with more than 300 leaders attending in total. This past year also saw the launch of EdTechTeam Products (in the tradition of launching Breakout EDU, which which spun off as an independent company in 2016). With an initial focus on developing FREE apps and extensions designed for the modern classroom, the new product development group officially launched four extensions on October 15, 2017. By the end of 2017 these extensions had more than 100,000 collective users. In November 2017 EdTechTeam spun off the new Student Voice Foundation as a California Nonprofit and launched the Global Student Voice Film Festival (similar to handing off Future Ready Schools to the nonprofit Alliance for Excellent Education in 2014). In partnership with WeVideo, this new student media festival builds on the success of the GEG Chicagoland Student Film Festival and moves into the void left by the White House Student Film Festival to offer K12 students around the globe a chance to share their stories and perspectives. The goal of the festival is to empower student agency – to embody the mindset that students don’t have to wait until they grow up to make a difference; their ideas can impact people now. Participation is FREE for all students and teachers. EdTechTeam also moved forward with Diversity, Equity, and Inclusion efforts in 2017. The year began with a dedication to “improving diversity on our team, at our events, and in our field.” The core team of full-time employees has further diversified this year, as has the extended team of contractors tapped as keynotes, spotlight speakers, and project managers throughout the year. Baseline diversity data was also collected for the first time in 2017. In summary, on average the presenters at 2017 EdTechTeam events were 46% female and 16% educators of color. (In total, the cohort of presenters paid over the course of the year was actually a bit higher at 49% women and 19% educators of color.) Considering US teachers are 76% female and the student population is closer to 49% students of color, the need for continued improvements in 2018 is clear, and EdTechTeam has a concrete internal action plan for closing this gap. Meanwhile, in 2017 EdTechTeam supported and sponsored a GEG Chicagoland Educators of Color networking event in September, a similar Educators of Color meet up at LEAP Innovations in October, and in December the first Our Voice Academy, an exclusive and intense new two-day program for developing capacity in spotlight and keynote speakers of color. For the December All Team Retreat, EdTechTeam also engaged a well-renowned diversity consultant with experience in education and business to work with all employees for a full-day, before beginning a longer term retainer with the team in 2018. EdTechTeam employees also continue to give generously from their work hours (EdTechTeam encourages 20% time), their personal time, and their resources (both company and individual) for volunteering or donating to schools and other educational endeavors. Through our long running quarterly grant program, the team gave away three days of FREE custom professional development and five classroom sets of Chromebooks for 1:1 pilots, including one through the DLP program, and one donated to a school that lost everything in the Santa Rosa, California wildfires. Individual employees often present for FREE at face-to-face TeachMeets, edcamps, other regional conferences, and for local pro-bono workshops… or virtually for a variety of different organizations and causes. Several have served as volunteers in local classrooms, at regional lab schools, at after school math or technology nights, in gifted programs, at student council events, and during the Hour of Code. Some even built skateboards for the Travis Mills Foundation or worked with The Hand Challenge to help provide over 1000 3D-printed prosthetic hands to children in need.